News just in from Oceanstyle's Monaco office of a major €500,000 price reduction on their joint listing with YCO, the 26.9m motor yacht Kiluanje. MCA compliant, she's a Leopard 27 Sport design yacht, built by Arno in 2005 to a Paolo Caliari design. Rarely used and never slept in, Kiluanje can accommodate six guests in a master suite, double stateroom and a twin cabin. 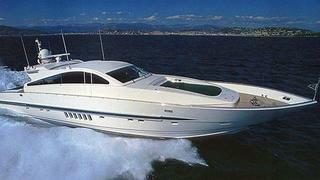 A maximum speed of 39 knots and a cruising speed of 36 knots can be achieved powered by two 2000hp MTU diesel engines. Lying in the South of France, Kiluanje is now asking €2.5 million.